Downey has a history of being known for growing oranges. By the late 1800s, there were many acres of orange groves covering what was to become Downey. Although the groves are now gone, many orange trees remain in front and back yards. We have shared pictures of several of them over the years, but I have never encountered an orange hedge. 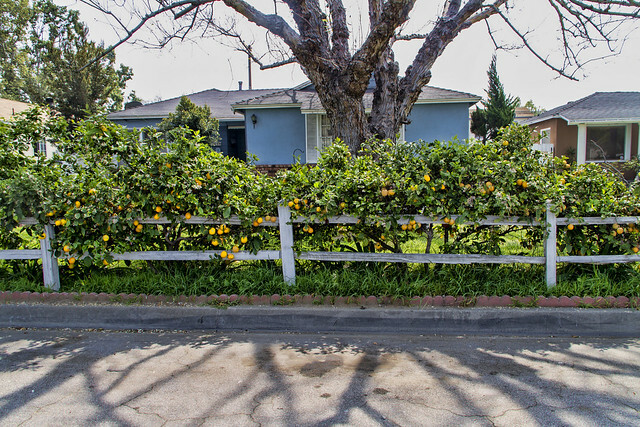 Whether this is an old or a new orange hedge, clearly it is thriving and continuing the legacy of Downey's orange-growing abilities.